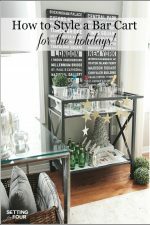 See this quick and easy DIY marble bar cart top and shelf tutorial to give your bar cart the look and elegance of real marble! 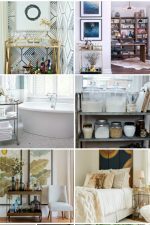 Marble bar carts are so gorgeous but are SO expensive! Get the look of Carrara marble for less with this easy marble DIY project! 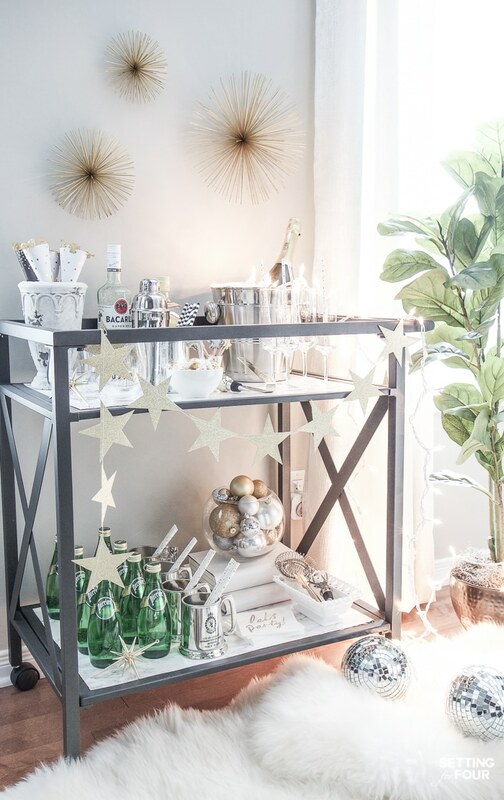 Marble bar carts are so so gorgeous but SO expensive! 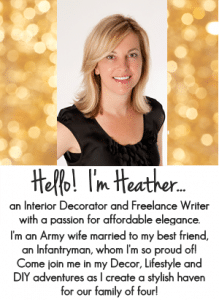 I love the look of them so I figured out a way to give our black bar cart a marble look for less! 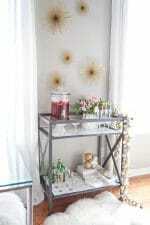 See my tutorial and easy hack to give your bar cart an upscale marble style! faux marble adhesive film – this one is the most realistic faux marble films on the market! clear adhesive dots – I love these and use them for all kinds of things! 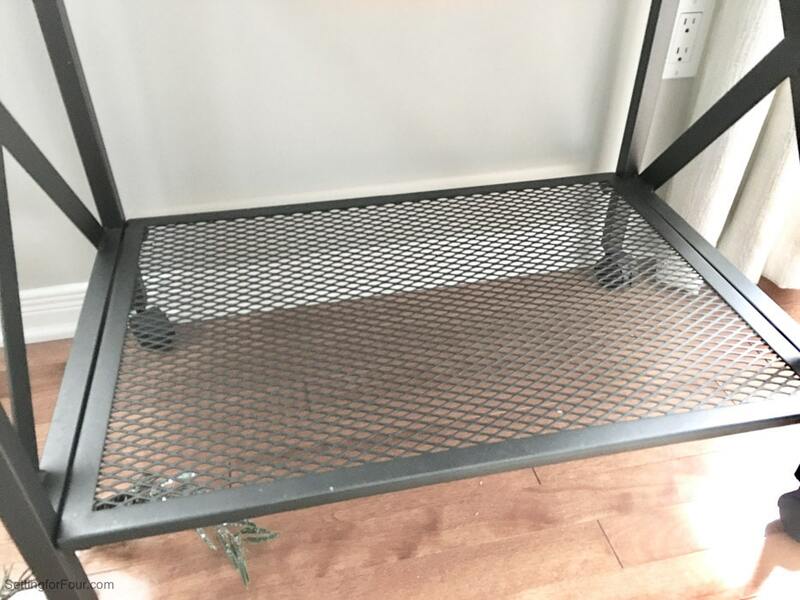 This is my bar cart shelf that I want to cover. Our bar cart is an indoor /outdoor bar cart so it has the holes to allow water to drain through it. 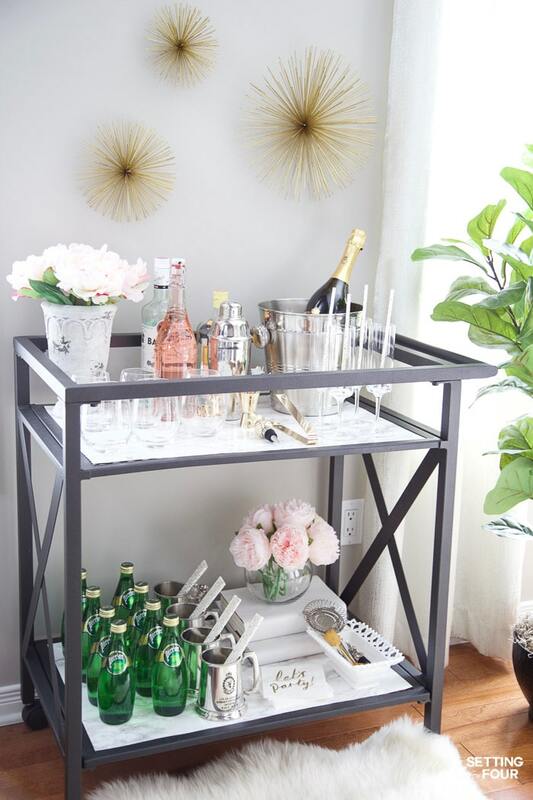 Measure the length and width of the top of your bar cart. 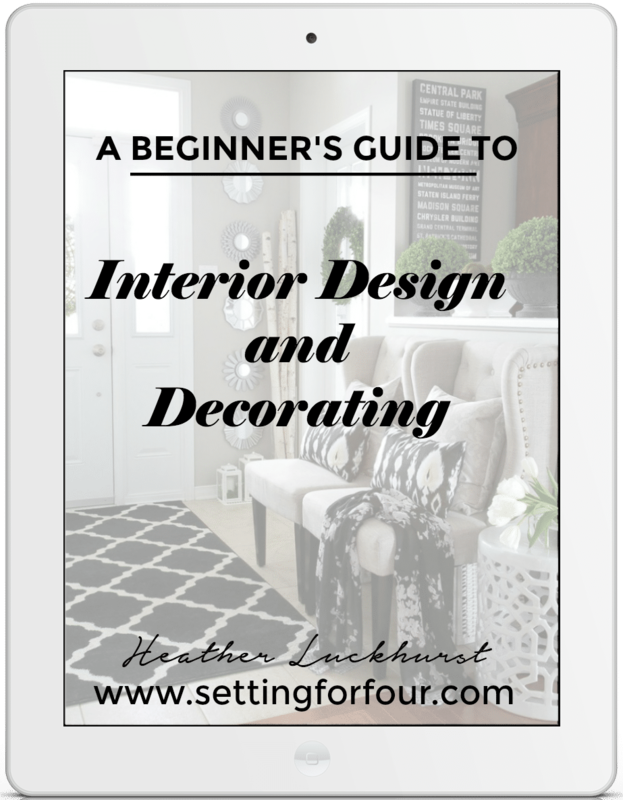 Also measure the length and width of the bottom shelf if you are going to cover it as well. Using the pencil mark the dimensions of the top of the bar cart onto one sheet of white poster board. Do the same for the bottom shelf using the second sheet of poster board. Cut out each piece using scissors. On a large surface unroll and lay out the faux marble adhesive liner so that the underside (side with cutting lines) is face up. Use cans of soup or veggies on each corner to make it lay flat. 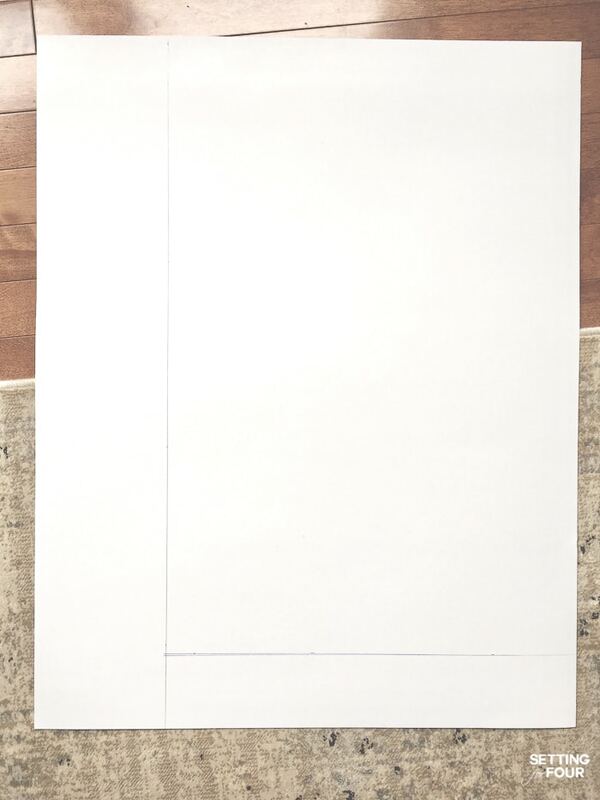 Lay the top poster board onto the adhesive liner and using pencil trace the poster board onto the adhesive liner. With X-acto knife cut out the adhesive film to size. 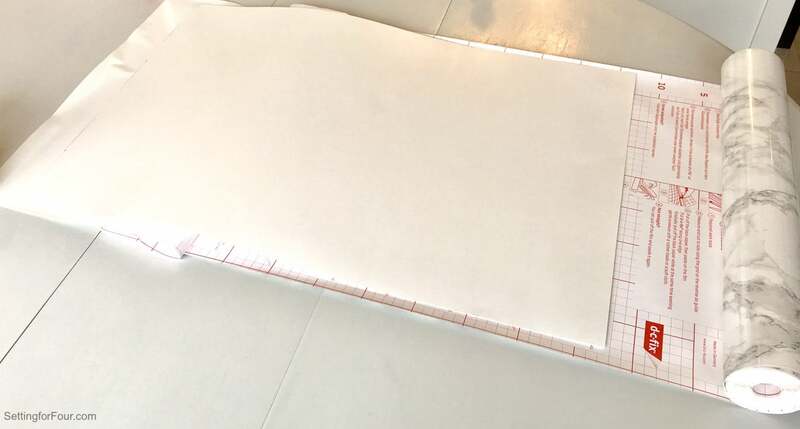 Remove backing of adhesive film and lay onto the poster board. Smooth out with your hands and smooth out any bubbles using the smoothing tool. Treat other side of poster board the same way so it’s covered in film too. 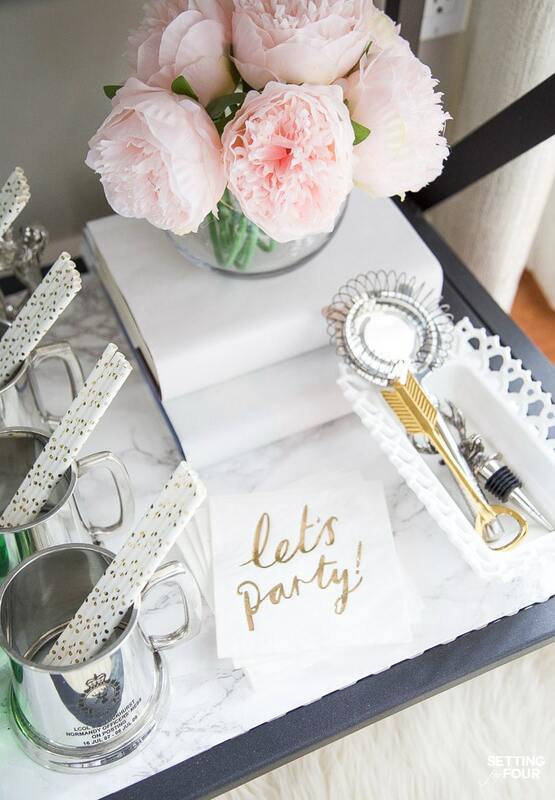 Lay the marble poster board onto the top of your bar cart and secure if you’d like with the clear adhesive dots. 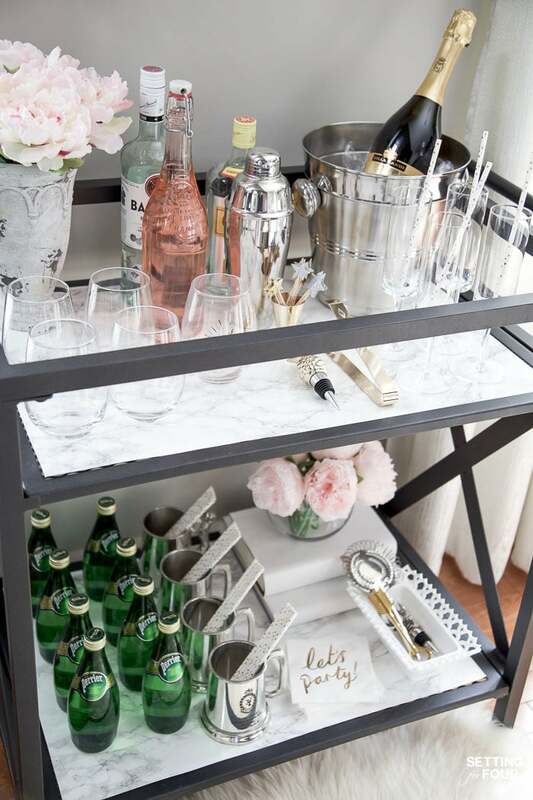 You’re done and now have marble shelves on your bar cart! This marble adhesive film really looks like the real thing and gives my black bar cart an elegant, classy vibe. You can use this gorgeous marble adhesive to update so many things such as trays, shelves, a coffee table, console table, boxes and more! 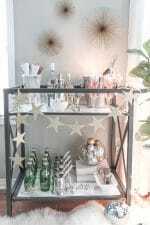 I hope you liked my DIY marble bar cart top and shelf tutorial! Do you think you will try it? The is beyond pretty, I love it. Totally fanstastic. I got to give this a try. Never heard of this marble looking board. Sorry if you mention it, if you did, I overlooked it, so can you please let me know where can I find this? Your bar is fabulous.